In case you didn't know Halloween is one of my favorite holidays. I am not sure why but it has been since I was kids. Maybe the candy, the costumes who knows but I love it! I found these cute little coffins at M's. They come bare wood and you can paint them or cover them with paper. Anything you want really! I painted this one with normal acrylic paint on the inside and the outside and then just dressed it up a little with some stamps, ribbon and 3-d stickers. The Do Not Enter on the front I cut from Mini Monsters. I just got this cart and I love it but I haven't used it much yet! Super cute and easy. I think kids would have a great time making these! It is here! After some back and forth with the post office and trip to a different PO location I have my amazing swap from Jen. I really want to thank her because not only did she do an amazing job on the hand-made items she clearly really took the time to figure out my likes. Everything is perfect and I love it all. See for yourself! B - The picture doesn't even do this journal justice. I love it and the quote book is awesome because I am always looking for things online. P - An assortment of my favorite cardstock and this beautiful, BEAUTIFUL frame with a picture of Isadora in it. A - Again, my favorite adhesive and I can't wait to hang this altered wood P in my scrap room once we move! M - The metals are awesome, two packs of butterflies and the other package is baby themed which is perfect for the things I am working on right now. The maganet page is very cool. It is already hanging on the fridge. This is such a cute idea, it is laminated to work like a dry erase, so cool! I have wanted the Pop Culture boarder embossing folders forEVER! Thank you so much. The altered clothes pin is sO pretty. My very first Spellbinders product ever! I know right? I look at these all the time online and always wanted to try them. I am super excited to try this out. Now I can blame it on Jen when I start buying more of these! lol The can is so cute I can't open it! I have know idea what it inside because I haven't opened it but it says "A little Yummy for your Tummy" Jen I love this stamp and would love to know where you got it??? Again thank you so much for really taking the time and selecting things that I LOVE. It was well worth the wait to receive all these awesome goodies. 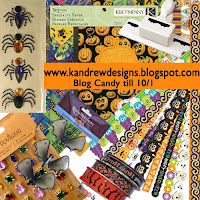 If you want a chance to win some amazing Halloween Blog Candy you need to head over to Getting Cricky and check it out. She reached 450 followers and she doing a huge giveaway! There are several ways to enter for a chance to win. When you leave a comment on her blog please tell her I sent you! I haven't done many ATCs but I always see them when I am surfing around on different message boards and I love them. So I signed up for a ATC swap with a "Home Sweet Home" theme. The hostess is very flexible and left "Home Sweet Home" to the creators own interpretation. I have seen some that the other ladies have created and they are amazing! I sort of went with a vintage look. I am not sure that was the "plan" but that is how it came out. I used LP in White Opal and when it was all done I sprayed the whole thing with Pearl Glimmer Mist. The sentiment says "A house is made of walls and beams A home is built with love and dreams." I love this quote and if you have been following my blog for a while you might have seen this post! I want to thank everyone who hopped along and all my new followers. If you didn't download the cut file for the school days workbook you can do that here. For the blog candy winner I used random.org and it selected 31 as the winner! That was Melissa! So please email me at posterday@gmail.com so I can get the goodies out to you in the mail! Your album is fantastic! Thank you so much for sharing the cut file! I will definitely be coming back for it! I'm sad...this is the end of the hop! I hope Crystal plans another one soon! Welcome to the Cricut Card Fairy Back to School Blog Hop! You should have arrived here from Beejay's Blog but if you didn't you can go back to Caitlynsmommy where the hop starts. Thank you for joining us! Do you need some last minute back to school ideas? How about ideas on scrapping those school pictures? Just like the school themed items? Then do we have a great bunch of inspiration for you! So sit back, relax, grab a drink and snack and enjoy the Second Cricut Card Fairy Back to School Blog Hop! Our second blog hop is sponsored by the very talented and generous Regina from CUTTING CAFE. She cranks out amazing designs almost daily. She is also very generous. She has donated a great grand prize for this blog hop AND gave us fairies images to work with! For my project I used the All About School Set. You can visit her site at the link above to see all her great stamps. EDIT: If you would like the cut file for this book you can download it here. I would love to see what others do with this book. I cut each letter with chipboard, and then cut the letters again with patterned paper. The first time you cut the letters normal and the 2nd time you put you patterned paper face down on the mat so that you can cover the back of the chipboard letter. If anyone has any questions just let me know. I decided to do a "School Days" word book. I cut it out using the E, Base Camp and My Community. I used Close To My Heart Ink and markers in Star Spangled Blue, Holiday Red and Goldrush. All the digi stamps are from the Cutting Cafe. I will use random.org on September 6th to select a winner. All you need to do to be entered is leave a comment on my blog and visit all the other ladies in the hop, check out their awesome creations and leave each one a comment.